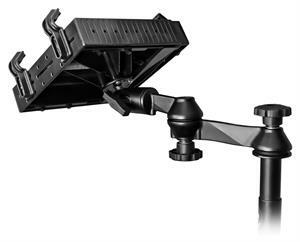 The RAM No-Drill™ Laptop Mount for the 2015-2017 Ford F-150 features a heavy-duty steel mounting base custom designed to fit this vehicle perfectly. 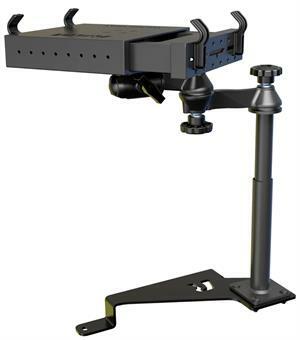 Using the front bench or passenger side seat rail bolts as attachment points, existing hardware is used to secure the laptop mount base in the vehicle. The included RAM Tough-Tray™ is spring loaded to accommodate 10" to 17" laptops. The tray features four adjustable retaining arms with rubber grip feature. These arms can be moved both vertically and horizontally, enabling a custom fit for varying thicknesses of laptops and access to ports or drives. 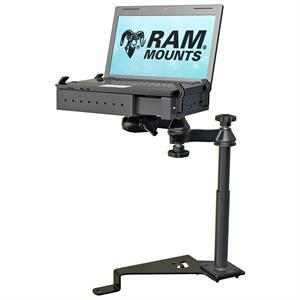 Because of their unique and patented ability to absorb damaging shock and vibration, RAM laptop mount desks are the perfect choice for securing computers, tablets and electronics of any type.